The name just leaves a sour taste. He doesn't have a good name, a terrible reputation. Why support someone who isn't exactly a team player. I disliked datslocos before there was datslocos Oregon. Also why not a more original name? Adding Oregon to that is like adding random numbers to the end of a screen name. Then there is the whole problem of canby weekend. That doesn't help. Probably would be more appealing if the group had a different name and separated from the California group. Also, get a website where information can be found. Facebook is terrible for all things except immediate answers. Thank you for your reply. As I told Flatcat,I have never met Datsloco,(the Person ). I haven't been out of Oregon, since Datslocos Oregon was formed. As for why we are named the way we are. That is probably a question better answered by Albert (Denmark Boy) ,since he is the person who started the club,& has done the bulk of the work building our club, paying alot of the running costs,much of the Canby truck project out of his own pocket. I was very honored to be asked to lead a regional group. I put alot of effort into the club,& continue to do so. A few months ago I was promoted to Vice President, because of my work for our club. Again, I felt very honored. We have had a few rough patches. One being all the stupid drama over the Canby truck, & the other being the difficulty over our event being the same weekend as Canby. I was not part of that decision, but I can assure you all that the date chosen was strictly a matter of jumping on the opportunity to hold a big event, at a great location. It is my personal goal to make the best of the situation this year,& hopefully coordinate with the leadership of Datsuns NW, in order to provide an even better couple of shows next year, & in the future. We will also continue to support the Blue Lake show, & Datsuns around Bend, plus any other events we can. Eh, hem...been daily driving it for a few months now. Gatoland was at the end of March. Brought lots of datsuns together just for the giggles of doing so. Excellent representation of your clique. Kudos. That was meant as a little ribbing to the trailer queen crowd. It was not specifically directed at you (flatcat),or anyone else in particular . We held a spring Fun Run recently. A few people didn't participate because it was a little rainy. Having grown up in Oregon, I am quite used to rain. I drive my '70 Goon every day, rain or shine. So I have a tendency to tease the people who only drive thier Datsuns on Sunny days. I didn't mean to offend anyone. I half planning on making my car a dry weather only car. Planning on too much horsepower for wet roads. To each thier own I suppose. As much as it rains here,it would be rough for mine to be a dry weather only car. Is it sunny more often where you are? As for the shows,cancelling one is out but I will be campaigning for separate weekends, so that everyone is more encouraged to go to both. Honestly, I can't promise anything. We will have to wait & see. My opinion to that...it should have been planned as far away from Canby as it could. One hoopla to start the summer. One hoopla to end it. I'd love to have a decent Datsun event here, TriCities, mid-september or so. Great way to end the year before our cars get packed away for the winter. Something like that sounds like a blast. We can talk later aboot it. Text me. If you don't have my number, get it from Issac. It does dude. I've found more Datsun owners here in Yakima, been talking to them and they're down to join the meets and cruise around too. (310, 620 std cab and a b210 hatch). I'll ask Isaac for your number. 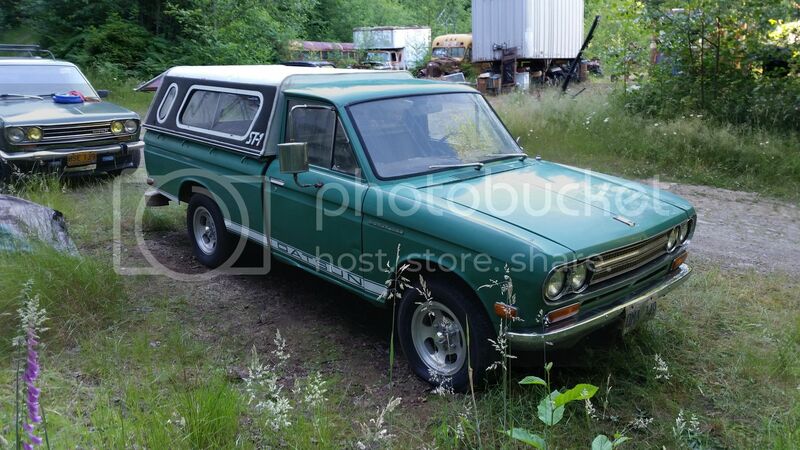 So,does this mean that there is a possibility of another Datsun event ,this one being in Washington? I don't care who runs it,or what club/no club puts it on. The more Datsun related activities the better, in my personal opinion. Yeah. Equal to the last Datsun event I had in March....that was held in Washington. Yeah,I wanted to go to that! Are you going to have that going again next year? If I know far enough In advance I might be able to go.